New copy of 300: The Art of the Film Hardcover from Dark Horse Comics. US$13.90 which includes shipping with USPS Media Mail within the continental United States. Orders placed before 4PM EST ship same-day. Published: December 20, 2006, Original Cover Price: $24.95 1st printing. What does it mean to turn one of the great graphic novels of our time into a major motion picture? In 1998, Frank Miller shook the comics world with his groundbreaking series 300. Marking Miller's first collaboration with watercolor artist Lynn Varley (Ronin, The Dark Knight Returns) in over a decade, 300 was a gritty reimagining of a battle in which three hundred Spartan soldiers fought to hold back the entire Persian army. The series won three Eisner Awards, including Best Limited Series, Best Writer/Artist (Miller), and Best Colorist (Varley). 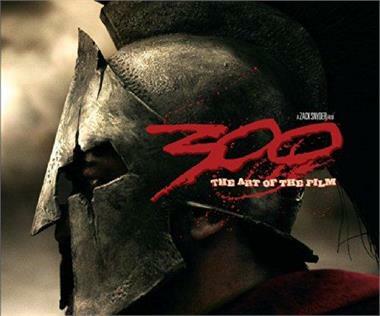 300: The Art of the Film takes you behind the scenes as director Zack Snyder (Dawn of the Dead) adapts 300 to the silver screen. Including more than 100 pages of production photos, concept art, and much, much more, 300: The Art of the Film is sure to delight Miller fans and movie buffs alike. "I knew this wasn't another typical sword-and-sandals movie, or a seven-hour-long lesson in historical accuracy. There are dozens of ways to retell the Battle of Thermopylae, but to adapt the story as presented in 300, I knew this was as much about bringing Frank Miller and Lynn Varley's visual style to life, as it was about the historical event itself." Hardcover, 128 pages, full color. Cover price $24.95. This item is brand new and bagged in plastic.